Interactive agency appMotion delivers solutions to meet clients’ needs in the area of digital communications. Our core competence remains IT projects for web and mobile such as: websites, mobile applications, CMS and e-commerce. We also specialize in advertising and analytics in web and mobile channels. Our synergy of competences results in holistic approach and high quality results. Our products’ commercial success is founded on close cooperation with clients. We discuss together a detailed plan of activities. We tie up loose ends before even one line of code comes out. Individual approach towards every single project and many years of expertise result in outcomes exceeding the expectations of our customers. Clients usually come to us to reach goals such as boosting up sales or increasing brand awareness. Yet they do not know what type of marketing tool would be perfect to achieve a desired outcome. No problem at all! Using our vast expertise we will give you useful recommendations at every step of the project. Wow! 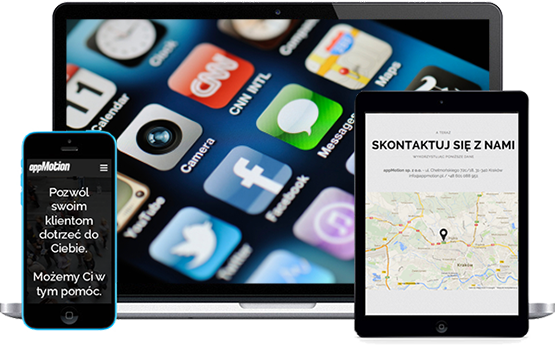 We have an outstanding experience in creating mobile applications. We are pretty good at making responsive websites. Our experts design interfaces to guarantee user’s maximum satisfaction. We run excellent performance-based and branding online campaigns. We analyse and optimise the traffic and the conversions in both web and mobile segments. Our applications are available for smartphones and tablets supporting the following operating systems: iOS, Android, Microsoft and Blackberry. In our work we apply solutions that permit intuitive application of our products using proven, but also flexible content management systems (CMS). We offer dedicated solutions, among others, for financial sector, online stores, news services and social media. In order to fully meet the requirements of mobile web users, think about lite version of your website. We create standard mobile versions of any web service and use special solutions based on innovative Responsive Web Design technology. Thanks to RWD, the predesigned website may automatically adapt in terms of content, image, specific elements and navigation to devices used for browsing the site. Professional website is an excellent opportunity to efficiently create your image. Innovative and bold approach allows us to bring your business to a higher level. We guarantee solid, proven concepts not restricted to purely esthetic values. We focus on functionality and transparency of websites so that using them is a true pleasure. Thanks to flexible and convenient CMS website content management causes no problems. We design web and mobile pages, applications, CRMs. We aim to achieve a maximum usability of our products in order to guarantee user’s best quality interaction. We run action-oriented advertising campaigns whether your goal is to get potential clients to leave you a lead or to multiply your sales results. We cover all the existing online advertising channels such as: search engine positioning (SEO/PPC), display campaigns (behavioural targeting: audience buying, retargeting, pretargeting), email campaigns (newsletter, behavioural targeting), lead generation and promo codes. We believe that content marketing is as effective channel of clients’ acquisition as performance-based actions, because good quality content make users convert. We know how to create unique, substantial and well-aimed content adapted to Client’s profile. We write e-books, blog posts, e-courses, white papers and other content. We create brand’s awareness on social media platforms. Social media helps you reach your target and deliver content that users are then sharing among others. We run social media accounts, fan pages, branding and performance-based campaigns. We want to know exactly where did your user come from and what type of actions did he accomplish on your website. That’s way we are analysing his customer journey, behaviour on the website and conversion rate for a particular ad channel/users’ segment/ad placements as well as for all of the advertising activities. We also optimise your conversion path. Let your clients reach you. We can make it happen. We have put together the best of our experience, the best of our talents and this is the result. Every time we make a plan & we put it in discussion to arrive at an excellent project. appMotion is a dynamic and much experienced team of specialists which has had implemented biggest IT projects both on the domestic market and abroad. We focus on innovative applications and mobile games and create comprehensive IT solutions for both individual and corporate clients. to make you truly satisfied with our products and services! We are passionate about new technologies! The codes on our websites matches the high standards of the promising HTML 5. We use these to magically transfer your clients into the world of the mobile apps we create. It is light and universal. They work on any device without overloading it. Our projects are ready for the newest high resolution display screens.